Do you ever feel like you are struggling to communicate with your child? Are constant tantrums challenging your daily routine or interfering with your child’s ability to learn and function? In this big, fast-paced world full of distractions and frustrations, it is easy to forget that everything can look and feel so much bigger to a child. What happens when we don’t have the tools we need to cope with big feelings and challenges? When we don’t understand these feelings or the environment and its triggers? When we aren’t able to communicate what we feel or think or need appropriately? Now, conversely, imagine something wonderful happens, but you are unable to share it because you lack the communication skills. This has the potential to turn an exciting moment into a frustrating one. Several years ago, I received a referral to provide therapy to a young boy diagnosed with autism spectrum disorder (ASD). This was my first referral to work with a child with ASD. I quickly realized that my mental health license and my training in play therapy were missing something to fully and effectively work with this child and his family. I began searching for established ASD treatments I could learn and incorporate into my work with this young person and other clients struggling with similar issues. Along this journey I eventually integrated models and evidence-based practices to create a protocol for mental health therapists and especially play therapists called AutPlay® Therapy. This was satisfying in my individual clinical work, but I still felt somewhat isolated in terms of a profession identity and accountability regarding my work with ASD. Do you find yourself telling your adolescent child “You Need An Attitude Adjustment”? For decades we have been told that cranky teens are just part of life. Know that this condition is treatable. Most bad dispositions and chronic fatigue can be treated with neuroplasticity techniques. “Brain Games!” Not the kind that your child has been playing on his or her tablet or phone. These are scientifically developed brain exercises that stimulate the frontal lobe to achieve maximum brain function. Today, Discovery Cove, in conjunction with the International Board of Credentialing and Continuing Education Standards (IBCCES), announced the completion of a staff-wide autism sensitivity and awareness training as well as an onsite review of the park property and guest experience. The completion designates Discovery Cove as a Certified Autism Center (CAC) as distinguished by IBCCES. The certification follows sister parks Sesame Place, the first theme park in the world to reach this accreditation, and Aquatica Orlando, the first water park in the world to be accredited. Pertaining to children with autism, we’re going to take a look at the task-negative mode and task-positive mode areas of the brain. These are located in the Dorsolateral prefrontal cortex, and are important to focus on patients with autism. Why? Because studies have shown that the corpus callosum in patients with autism has decreased in size (meaning a decrease in commissural fibers, axons that go from the left hemisphere to the right hemisphere of the brain) and they have more projection fibers (this being axons within the brain that go from the back of the brain to the front of the brain). This is important to identify as it shows how the projection fibers are in abundance within certain areas which results in over-stimulation of areas within the brain and also under-stimulation of crucial pathways that exist that the commissural fibers run through. OrlandoVacation.com has earned the Certified Autism Center designation and is only the second vacation home rental organization to do so in the country. The Certified Autism Center (CAC) designation demonstrates the organization’s commitment to ensuring individuals and families with children on the autism spectrum have the best possible experience when traveling. Parents with children on the spectrum often find vacationing and visiting new places to be a challenge due to sensory needs, dietary restrictions and safety concerns. With this certification, guests can rest assured staff are prepared to help all families, regardless of their needs. Today, Aquatica Orlando in conjunction with the International Board of Credentialing and Continuing Education Standards (IBCCES), announced the completion of a staff-wide autism sensitivity and awareness training as well as an onsite review of the park property and guest experience. The completion designates Aquatica Orlando as a Certified Autism Center (CAC) as distinguished by IBCCES — the first water park in the world to receive such a distinction. This accreditation follows sister park Sesame Place, which became the world’s first Certified Autism Center theme park last April. The results of our annual Special Education Survey are in: Over 400 respondents – special education administrators, teachers and other professionals – from all over the country weighed in on a range of topics related to special needs education. 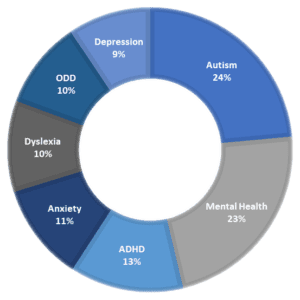 Although Autism-specific training and resources continue to be a primary focus, one of the largest increases was seen in the area of student mental health. In light of these recent findings, IBCCES is hosting the 2019 Space Summit in Houston, TX on May 3rd, and mental health will be a primary focus of this unique one-day event. Located on-site at the Houston Space Center – an IBCCES Certified Autism Center – this symposium will feature TED style talks by some of the leading authorities in the areas of Autism and mental health. Attendees will benefit from sessions led by global experts on autism, cognitive disorders, mental health concerns, and innovation in these areas. These topics affect ALL students and adolescents, as well as many educators themselves.